Where did the summer go? Refrigerator and icemaker repairs kept us busy, and we didn’t discover the meaning of “lazy days” of summer. Your schedule was probably similar. Between planning vacations, driving to camps or having the kids at home from June to August, you were probably too busy to think about maintaining appliances or were too hot to care. Now that the children are back in school, it’s time to fall into a routine. This is a great time to schedule your Sub-Zero repair or routine maintenance so you’re ready before the holiday season begins. You may think, “If it ain’t broke, don’t fix it.” But that can be an expensive philosophy when you have to buy pricey parts and pay for labor for Sub-Zero repairs that result from a lack of routine maintenance. If you have the time and inclination, you can do the tune-up yourself. Just check your appliance manual or follow online instructions. But if you’d rather have an expert handle your DIY projects, then contact the trained technicians at C&W Appliance Service because our team does this every day. Clean the condenser coils. Remove dust, dirt, grime and pet hair that may be clogging air vents. Clear out the drain line. Bits of food or mold can block the line that drains moisture from self-defrosting features. Check and clean the drain pan. Cracks and leaks can lead to smelly mold in the drain pan or puddles on the floor. Inspect the door seals. When the rubber gaskets become dry or cracked, the doors do not seal properly. Examine the entire unit and identify potential problems for future service. We look at your icemaker, filters, compressor and other parts that can cause significant headaches if they fail. Once you have everyone in your house back into a routine, then take the time to do a little preventive maintenance before schedules get crazy again. 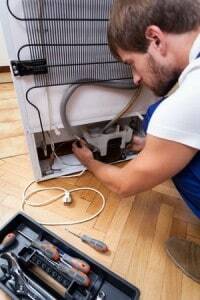 If your schedule is already busy, then call the trained technicians at C&W Appliance Service (855) 358-1496. Buy yourself a little time for $139.95 for your primary refrigerator and $30 to maintain any additional icemakers or refrigeration units at that time.